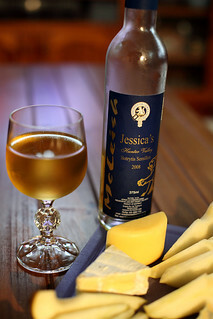 Jessica's Botrytis Semillon 2008, by McLeish Estate, Hunter Valley, New South Wales. My friend's uncle owns this winery, so of course we should try some of the wines! A lovely sweet dessert wine, slightly syrupy, strong orange flavour with a hint of peach, finishes with a bit of orange peel bitterness. A touch of fermentation prickle. Very nice - but I always love a sticky!